Baltimore Jimmy John’s worker and veteran James Hegler was fired on Sept. 5 in retaliation for organizing a union at his workplace and participating in concerted activity against low wages and appalling working conditions. 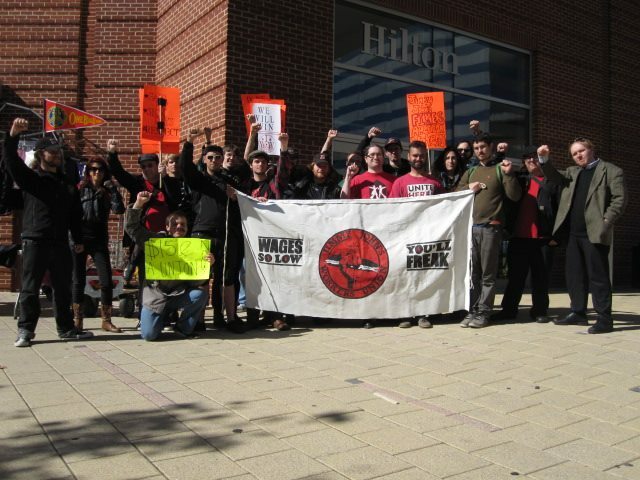 On Sunday, Oct. 19, workers and supporters picketed outside the Pratt Street Jimmy John’s to demand both the reinstatement of James Hegler and an end to illegal retaliation against workers. By firing James, Jimmy John’s management made it clear that they are willing to violate federal labor law in order to punish workers for organizing a union. By ignoring attempts to meet and discuss terms for his reinstatement, Jimmy John’s management hopes to break the organizing drive through intimidation and contempt for the National Labor Relations Act (NLRA). Workers responded with a picket to show Jimmy John’s that this behavior will not be tolerated. In addition to the picket held, the union is also filing an Unfair Labor Practice charge against Jimmy John’s and franchise owners Dolchin Pratt, LLC over James’ firing. This charge will be heard by the National Labor Relations Board, along with six other counts of illegal retaliation against workers engaged in protected union activity. When Jimmy John’s fired James Hegler, they put an American veteran on the street in direct contradiction of their pledge to support American military families. In July, Jimmy John’s gave a donation to Folds of Honor, stating, “Jimmy John’s is proud to be an American company and is privileged to aid families of veterans.” On Oct. 19, workers demanded that Jimmy John’s stand by their pledge to support military families by reinstating James with full back wages. In the city of Baltimore, where the low-wage service sector has grown rapidly, campaigns such as the one underway at Jimmy John’s have massive potential. Labor’s share of income has been rapidly stolen from working people at the same time that the low-wage service sector has been pulling in record profits. New efforts to bring justice to this sector are becoming more and more necessary in light of the gross inequalities and stunting poverty present in the city and across the country. The IWW sees the current efforts at Jimmy John’s as an important part of this larger struggle. The campaign in Baltimore is the second franchise in the company to go public as the Jimmy John’s Workers Union, the first being Minneapolis in 2010. Open to employees at the company nationwide, the Jimmy Johns Worker’s Union is affiliated with the Industrial Workers of the World (IWW) labor union.